The impressive structure consists of 5600 silicon rods suspended from an 18m diameter ring that hangs from ceiling to floor in the Roundhouse as part of the venue’s 50th Anniversary celebrations. 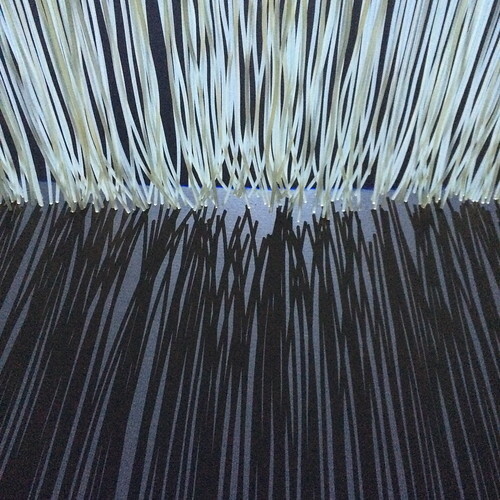 Detail of Ron Arad’s Curtain Call installation at the Roundhouse, 2016. Top: Javier Mariscal, ‘Colours Always are Beautiful’. Photo: David Levene. 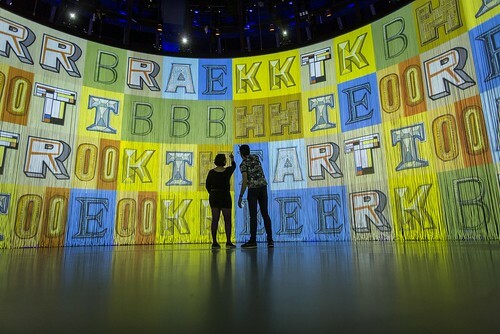 The renowned designer/architect’s work creates a fluid, flexible 360-degree projection surface for short films that can be viewed from inside or outside the cylindrical enclosure. First seen five years ago, the new version of Curtain Call can be seen daily at the North London arts venue until 29 August 2016. 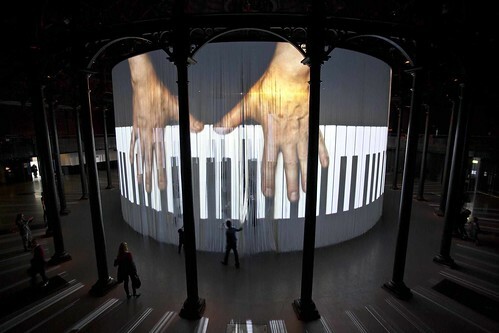 ‘Pianorama’ by Christian Marclay. Photo: Stuart Leech. 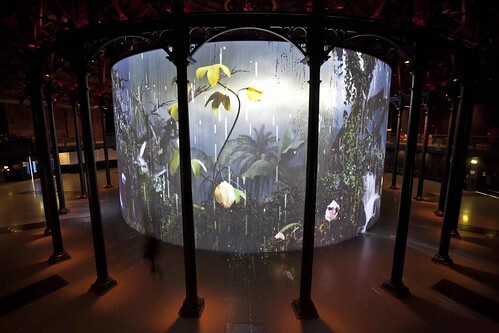 The installation was a thoroughly transporting and engulfing experience, and fitted beautifully in the Roundhouse space. The works projected in a continuous sequence included new films by Kutiman, Daniel Landau, Marshmallow Laser Feast and Universal Everything, plus films from the original 2011 installation by Babis Alexiadis, Mat Collishaw, Ori Gersh, Greenaway & Greenaway, Gabriel & Shira Klasmer, Christian Marclay, Javier Mariscal, SDNA and David Shrigley. Mat Collishaw. Photo: Stuart Leech. Each short film used Arad’s space in a different way: Mariscal’s ‘Colours Always are Beautiful’ is a fiesta of typeforms followed by an animated character dancing to fabulous flamenco rhythms (Niño Josele’s ‘Válgame Asere’) and morphing from a self-portrait to different characters from the Mariscal oeuvre, including Cobi –the Barcelona 1992 Olympics mascot – and others from his ‘Cobi Troupe’. 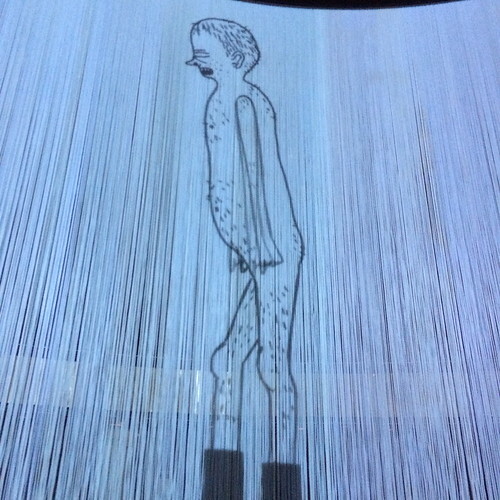 David Shrigley’s contribution was an animated black-and-white scrawl of a naked man who stomps hesitantly around the circular ‘curtain’ in heavy boots. On the soundtrack, each stomp matches his location. For Universal Everything’s ‘Parade’, colourful computer-generated creatures strut, sprint and sashay around the arena with confident aplomb. In ‘Waking Dreams’ by London agency SDNA, contemporary dancers perform simple motifs that were magnified and duplicated to create an almost Busby Berkeley-like canon of movement. Daniel Landau, ‘The Perfect (post) Human’. 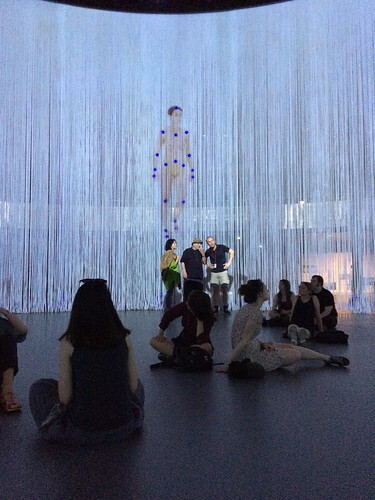 Dancers also populate Daniel Landau’s ‘The Perfect (post) Human’ in a witty satire of behavioural science reminiscent of motion-capture technology. The soothing, trance-like ‘The Fat Girl Gets a Haircut’ by animator Babis Alexiadis uses black-and-white line drawings to tell a story using natural forms such as birds, feathers and leaves in a surrealistic landscape. Javier Mariscal, ‘Colours Always are Beautiful’, seen from inside Curtain Call. Photo: David Levene. 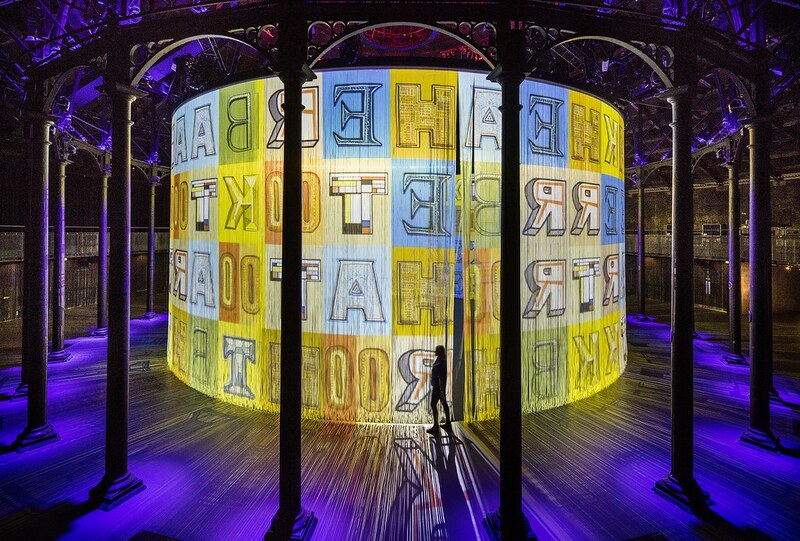 Ron Arad’s Curtain Call is sponsored by Bloomberg Philanthropies and runs from 6-29 August. The installation also features performances by Eska (Thu 18 Aug), London Sinfonietta (Sat 20 August, as part of the Proms), Dan Deacon (Wed 24 Aug) and London Contemporary Orchestra (Thu 25 Aug). Matthew Herbert performed on Wed 10 August. 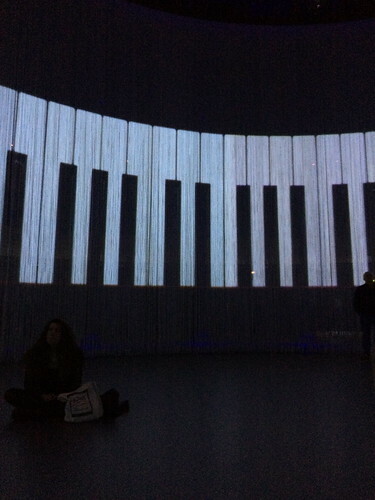 Detail from ‘Pianorama’ by Christian Marclay.